To a hot wind through your fleece that blows at noon? Flows toward desire’s everlasting swarm. Couple, farewell; I’ll see the shade that now you are. Pink & Red does not go together? There are these days where you feel the little rebel inside you… Many times you get told you cannot do this, you cannot fo that, that does not work, this will never go together and if you have one of those little rebel days you just need to prove them all wrong even by doing mistakes sometimes that you will never admit :p .
Today there was such a day and when I was looking through my inventory more and more the idea of a pink and red styling was growing in my mind. I anyways wanted to blog the new “AV Straight Leather Jeans” from Vista, so I started out with them, after I saw this fantastic red tone in the HUD. The Jeans come in various versions in different length. 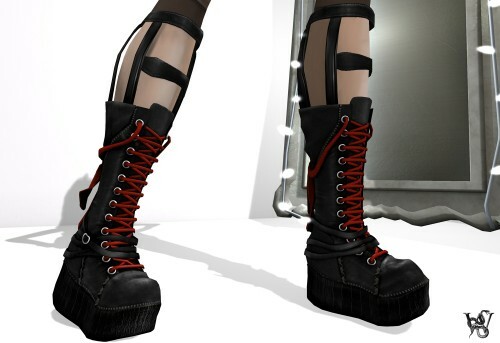 Usually you have the problem, that if you would like to wear some cool shoes with mesh pants, you always run into trouble, that they just eat up the shoes or you get some weird flickering if you try to add boots over the pants. With the “AV Straight Leather Jeans” those times are over. 5 different length of the pants make it possible that you can experiment with different shoes or boots. For today’s post I decided to go with the number 2 version, as I found the cool and as well funny “Abdomination Bitey Meaty Boots” from Curio Obscura and the number 2 was the perfect one for the half-long boots. Dressed with pants and boots.. maybe a little too less :p . What to wear for the top… ? I was sure I wanted to use one of the latest releases from Finesmith, the “Iris” set, but what to wear as a basic as I did not wanna go half-naked. It should be something soft, which does not overload the upper part of the body with the “Iris” set, plus I wanted to have a very soft pink to bring back the baby pink of the “Abdomination Bitey Meaty Boots”. The “Valerie Blouse” from LeeZu was the perfect choice. With the delicate and super amazing detailed texture and the awesome soft pink color it makes a great base for the jewelry. Because the jewelry had such an amazing and huge headpiece and I was wearing the jeans, which give the whole out fit kinda a cool touch, I wanted to wear some really short, fresh and modern hair. The “Cameron” hair style from EMO-tions exactly looked how I wanted it to for this look. The reason why I used the grey tone for the hair was, that I wanted to repeat the metal color of the jewelry. Now the look itself was done but I still missed the little i-dot. Then all of a sudden I remembered the “”Skeletonia” hand jewelry from Formanails. This idea of the skeleton hand wrapped over the avatar hand is something that has a little story to it. Back then before we had Slink hands I always was looking about something new and crazy for accessories. At Formanails I found a skeleton hand, made of prims that covered the back of the hand inspired by Madonna. I was wearing that hand jewelry in forever and ever so often that I nearly cannot count it anymore and I never found something similar. After i upgraded my avatar with the Slink hands I really missed this accessory badly. When I talked the last time to Ivi Bing, owner and designer of Formanails, I told her, that I discovered her store over that wonderful hand accessory years ago, that I really miss it so much with the Slink hands and all of a sudden she sent me over 3 versions of the “Skeletonia”. She made it for 2 different versions of the Slink hands – casual, elegant and elgant1. This so made my day! I have my skeleton hand jewel back in an updated version with a HUD that lets you change the colors of the gems and some more little details like the safety pins and barbwire parts. Thank you Ivi! And now… Pink & Red does not go together?